Links have always been a major component of SEO and they always will be. Link earning is a term that now often replaces “link building” – no matter what you refer to it as, the goal will always remain the same: get high quality links for your website. The only thing that changes is the strategy used to uncover link building opportunities. While many people believed that Google would devalue links and instead use social mentions as a strong signal in their algorithm, it was Google’s head of web spam, Matt Cutts that said they had tested the algorithm without using links as a signal and the results were complete trash. So, let’s just get that out of the way and make one point crystal clear: links are here to stay and will always remain the top signal. What will continue to evolve and change is the method in which those links are acquired. How Does Link Earning Work? Publishing compelling content on your website that is so good that it results in other websites naturally linking to it. Promoting your published content through various methods to place it in front of the right people, resulting in natural social sharing and linking. Establishing relationships with the top influencers within your industry, causing them to mention and link to your content and brand in their published work. Link earning requires you to focus on building your brand instead of focusing on building links. If you focus on publishing high quality content and spreading it to the correct outlets it is going to result in naturally acquiring valuable links. High quality content and outlets are going to help you earn links from the types of sources that help to improve your search engine rankings. Low quality links are very dangerous and just a small amount of “bad” links from a source flagged by Google can result in all of your hard work and SEO efforts crumbling down. Does the website publish high quality content? Does the content that they produce receive a lot of social shares? Is the content relevant to your brand? Would you want your brand associated with the website? Do they have strict editorial guidelines and don’t accept everything presented to them for publication? Is their incoming link profile strong and free of spam? Does the website feature a clean and professional design? Focusing your SEO effort on improving your brand and earning links rather than developing ways to build links help you to create a solid foundation for your brand online. This approach can help you earn links from the top websites in your industry. 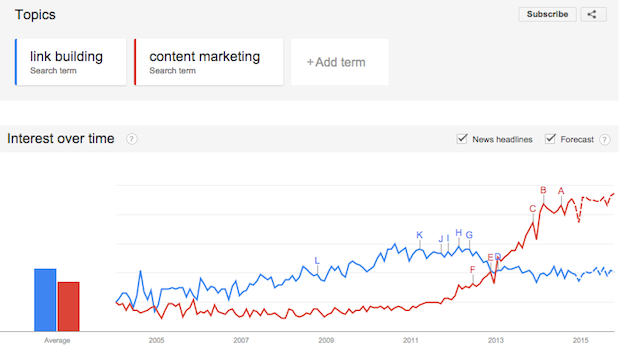 Look how the search term “link building” has declined and is predicted to remain flat, while the search term “content marketing” has seen a massive spike and is predicted to continue to climb as we move forward. The shift from link building to link earning is evident, and something every business needs to take into consideration. SEO is constantly evolving in terms of what methods are used, but acquiring links is something that is going to remain to be the goal. With more of a focus around building a brand rather than just building links will help create a stronger SEO foundation and higher quality links.